For the 4th year, Broome Associates has earned Catawba County’s award for worksite wellness. 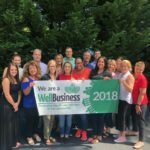 The advisory council for the WellBusiness program awards companies annually that are committed to establishing and supporting positive wellness practices in their workplaces. As a business dedicated to continuing wellness practices including nutrition, physical activity, and prevention, this is an honor for the agency. Along with 24 other companies in the county earning gold, silver, and bronze, Broome Associates accepted the Gold WellBusiness designation at the awards luncheon on Friday, June 22nd. 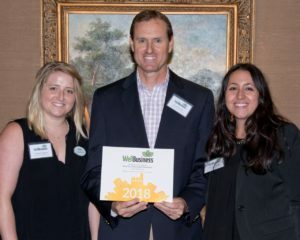 Scott Broome, Vice President of Broome Associates, along with employees and Broome wellness committee members Chelsea England and Jerrica Starnes, attended to receive the award. Our biggest accomplishment for the Wellness Program in the last year would be achieving our goal of increasing interest level and exceeding previous years’ participation. In order to accomplish this, our Wellness Committee has been super active in day-to-day promotion and marketing of specific wellness related events throughout the last year. It has really paid off! We surpassed our goal by having the most number of employees reach their individual wellness goal, ever! (nearly 75% qualified) By reaching this goal, they are able to participate in our semi-annual incentive trip to the US National Whitewater Center!